I'm sure that by now any respectable bacon lover has seen the bacon tuxedo. 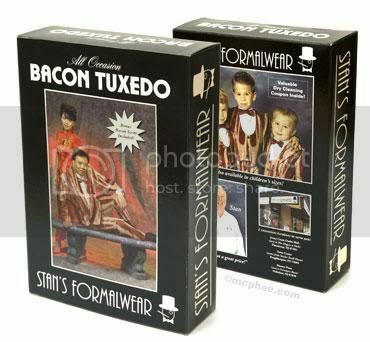 Sadly, this bacon-scented formal wear was just an April fools joke, however, Archie McPhee knows the power of bacon and has just released this Bacon Tuxedo Joke Gift Box ($5.95). Just put your real gift in this 9" x 13" x 3" Bacon Tuxedo Gift Box and depending on the gift receiver you may get either a priceless horrified look as the gift is unwrapped or a very disappointed bacon-lover! The box is detailed enough to make even the cleverest recipient think twice. To quote the guarantee from the side of the box, "If you find a better Bacon Tux, I'll refund you money, plus throw in 5 lbs. 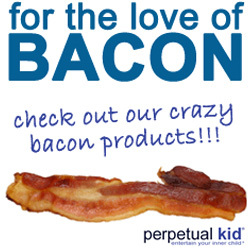 of thick-cut bacon for your trouble." 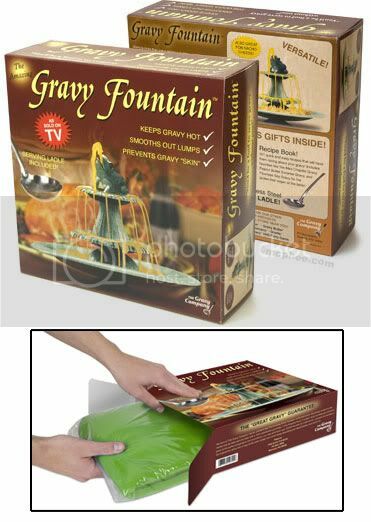 Also available is the Gravy Fountain Joke Gift Box of which I am only partly ashamed to admit that I wish it was a real product. Wrote about this too on my blog. Thanks for bringing it to my attention! thats funny. ha! ha! ha! where can I get one of these bacon tuxedo boxes?